Lewis Carl Davidson Hamilton MBE (born 7 January 1985 in Stevenage, Hertfordshire, England) is a British Formula One racing driver, currently racing for the Mercedes team. 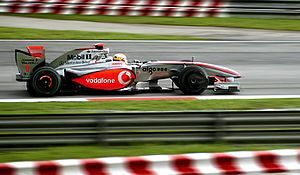 Hamilton won the British Formula Renault, Formula Three Euroseries, and GP2 championships as his racing career advanced. 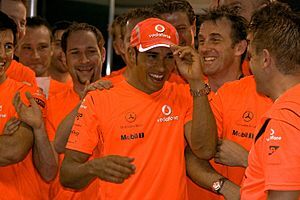 He became a McLaren F1 driver for 2007, making his Formula One debut (first race) 12 years after his first meeting with Ron Dennis. 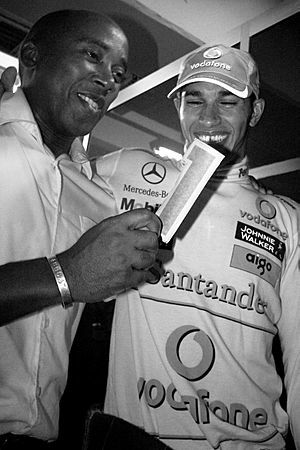 Hamilton comes from a "the first black driver in Formula One". 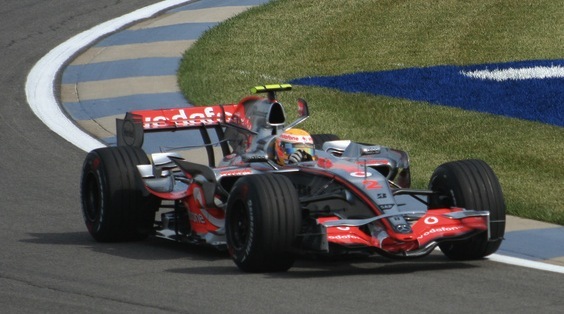 In his first season in Formula One, Hamilton set many racing records. He finished second in the 2007 Formula One Championship, just one point behind Kimi Räikkönen. He won the World Championship the next season by one point ahead of Felipe Massa. He signed for Mercedes at the end of 2012 to race for them in the 2013 season. His 2006 GP2 championship happened at the same time there was a vacancy at McLaren. Juan Pablo Montoya left Formula on to race in NASCAR, and Kimi Räikkönen left to join Ferrari. Hamilton was confirmed as the team's second driver. He would be paired with defending champion Fernando Alonso for 2007 season. He was told of McLaren's decision on 30 September. The news was not made public until 24 November. McLaren was afraid the news would be overshadowed by Michael Schumacher's retirement announcement. During qualifying for the European Grand Prix, Hamilton crashed at the Nürburgring. He was unable to complete qualifying and started the race in tenth position. During a heavy rainstorm which caused the race to be temporally stopped, Hamilton slid off into a gravel trap. He was able to rejoin the race after the restart. His ninth place finish in this race was his first non-podium and non-points finish. Hamilton won the Hungarian Grand Prix from the pole position. 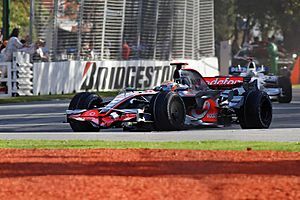 At first, Alonso had set the fastest time. He received a five start place penalty for blocking Hamilton in the pit lane. This prevented Hamilton from running his final qualifying lap. McLaren was penalized also. They did not earn any constructor's points for the race. In the Brazilian Grand Prix Hamilton failed earn any championship points. He finished the race in seventh position. Hamilton was passed by Räikkönen at the start. He was blocked in by Massa and Räikkönen into the first corner, and caught off balance. Hamilton was passed by Alonso in Turn 3. Hamilton attempted to re-pass Alonso in Turn 4. He ran wide, and dropped to eighth place. Then a problem started on lap 9. Hamilton had a gearbox problem. He was stuck in neutral and could not select any gears. Hamilton reset the settings on his steering wheel. The gearbox started working again. He had lost 40 seconds while his car was coasting. For most of the race, Massa was leading and Räikkönen was in second. If the race had ended this way, Hamilton would have become world champion. During the second round of pit stops, Räikkönen the lead from Massa. Räikkönen won the race to become the Formula One world champion. Hamilton finished the season with four wins, and in second place in the World Drivers Cup with 109 points. 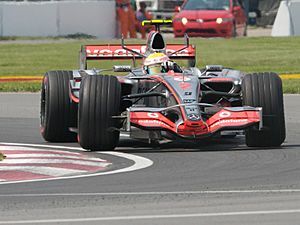 Hamilton was penalised by the race stewards at the 2008 Belgian Grand Prix for illegally gaining an advantage, by cutting the previous corner and passing Kimi Räikkönen. 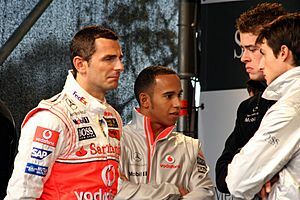 The penalty resulted in Hamilton dropping from first to third position. Hamilton retired from Canadian Grand Prix after colliding with teammate Button. Hamilton at the 2014 Chinese Grand Prix. 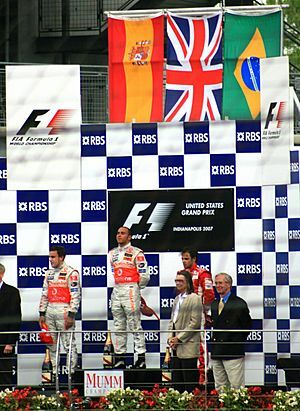 By winning the race, Hamilton achieved three consecutive wins for the first time in his Formula One career. 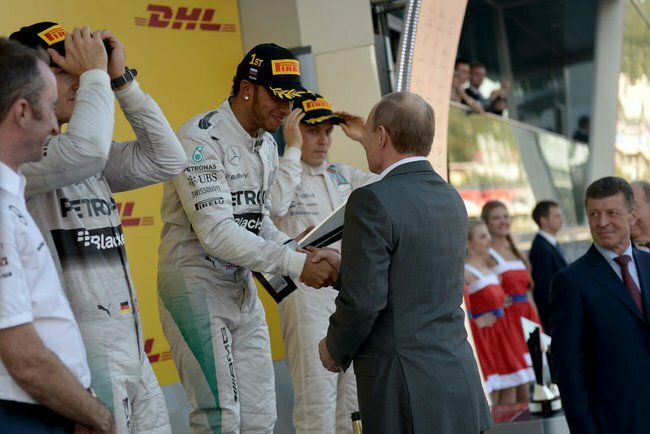 Hamilton is congratulated by Vladimir Putin, the president of Russia, after winning the inaugural Russian Grand Prix in 2014. Lewis Hamilton Facts for Kids. Kiddle Encyclopedia.